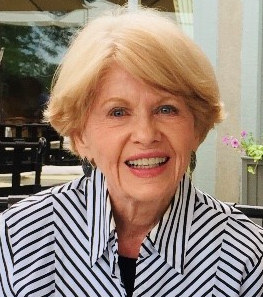 (nee Sharkey) Passed away to Eternal Life on January 25, 2019. Beloved wife of the late Walter M. Christensen, Sr. Loving mother of the late Walter Jr., Paul, and Francine (Gregory) Purcell. Cherished grandmother of Grace, Michael and Colleen Christensen; McLean, Charlotte, Miles and Leo Purcell. Fond sister of the late Eugene and the late Fred (Maureen) Sharkey. Polly will be remembered by many friends and family. Polly was a fun loving character who had a wonderful modeling career as a young woman, and progressed to being a business woman following the untimely death of her husband. She is very loved and will be deeply missed. A visitation will be held on Wednesday, January 30, 2019 at St. Jude the Apostle (734 Glenview Ave, Wauwatosa, WI) from 10:30 AM until the Mass of Christian Burial at 11:30 AM. In lieu of flowers, please consider a donation in Polly's memory to NAMI (National Alliance on Mental Illness) of Greater Milwaukee at 3200 S. 3rd St, Ste 6, Milwaukee, WI 53207. The NAMI phone number is 414-344--0447.